This is the sewage leak off Fisher Island, recorded by a Miami Waterkeeper diver. County spokeswoman Jennifer Messemer-Skold, said that, as of Tuesday afternoon, the county had set the repair process into motion, starting to test the affected waters and mobilize contractors. She also said recent testing has come back suggesting “good beach water quality” for nearby beaches. Last August, a fisherman alerted the county’s Water and Sewage Department to a possible sewage leak less than a mile offshore of Fisher Island near Virginia Key. Though the exact amount of sewage released so far is unknown, the pipe in question can pump up to 143 million gallons per day. According to Messemer-Skold, employees of the department checked out the area after receiving the tip in 2016 but saw no sign of a leak. “Nothing was found,” said Messemer-Skold. “Staff went out and evaluated the area. It just was not documented in an email format.” She said that in the fall of 2016, the department put together a request for bids to inspect the pipes. 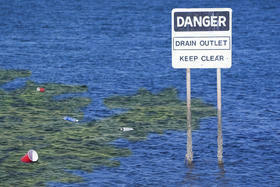 Last month, Miami Waterkeepers received a call from a citizen about a spill in the same region. Now the group is concerned that the pipe has been leaking waste for a year. This pipe, called an outfall pipe, is meant to carry waste about three and a half miles offshore. There it opens into the ocean, the idea being that the contaminants will dissipate. Because of environmental concerns, the state has decided to phase out this type of pipe by 2025. “Just because these are going to be discontinued doesn’t mean that we should cease inspection and maintenance of the pipes in the meantime,” said Kelly Cox, staff attorney and program director with Miami Waterkeeper. She said this particular pipe is 51 years old. Activists are abandoning a federal challenge of Florida’s water quality standards after the Trump Administration refused to step in.